NRICH has been invited to lead a series of six linked face-to-face PD days for teaching staff at the Evelina Hospital School, London. These will take place during the academic year 2018-19 and focus on developing rich mathematical curriculum-linked resources for their pupils. Teaching staff will work with a member of the NRICH team at each professional development session to explore ways of embedding the three aims of the school mathematics curriculum and will consider how best to support their pupils and students in developing appropriate strategies for problem solving, reasoning and fluency. 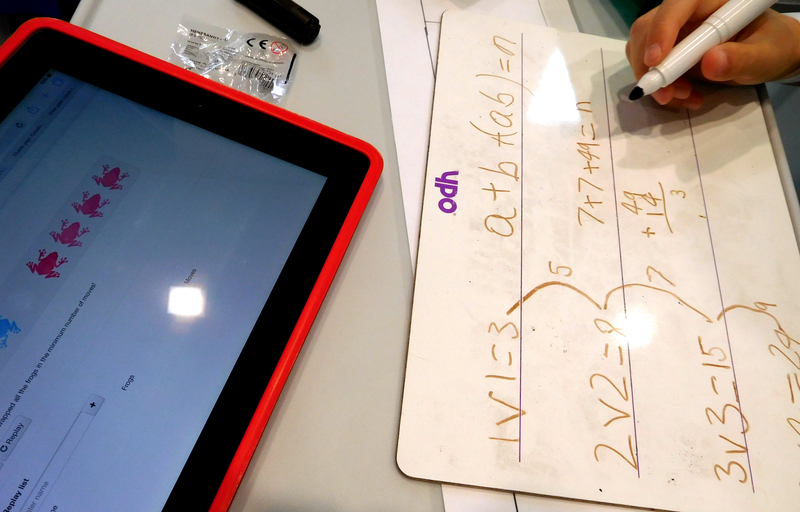 Each session will offer opportunities to explore the role of NRICH tasks in nurturing confident, resourceful and enthusiastic teachers and learners of mathematics, and gap tasks will ensure the development of these ideas throughout the year. This page summarises the content and discussions during each professional development session. If you would like anything uploading to this page, or have any queries about the project, please contact the NRICH team. In session 1, we explored the stated aims of the school mathematics curriculum and compared them with the additional expectations represented by the rope model for teaching mathematics, especially the focus on developing positive attitudes towards mathematics as well as the importance of nurturing resilient learners. To use one of the above activities with pupils in conjunction with the Teachers' Resources. Then to make notes to supplement the existing Teachers' Resources for the task, which reflect supporting the additional needs of pupils in a hospital setting. We enjoyed an incredibly useful session sharing feedback about the various activities which colleagues had tried out on the wards with students - many thanks to everyone who shared their ideas. Both Frogs and Estimating Angles were popular choices for the gap task activity. 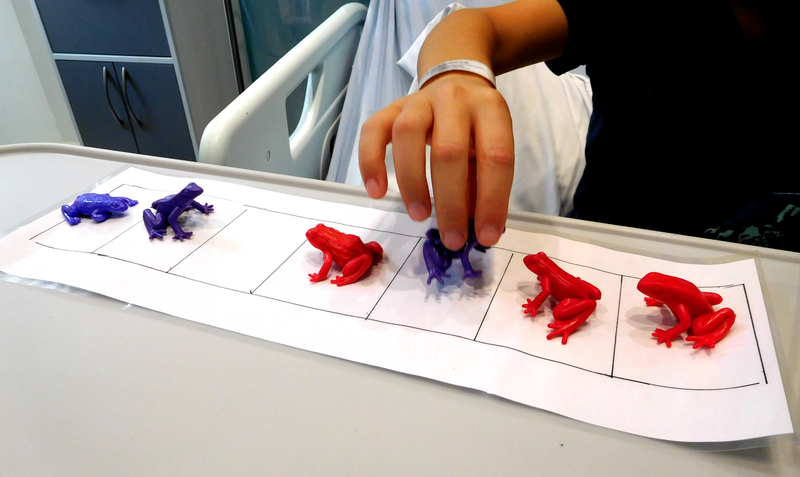 Here's a photo from one of Argon's sessions where he was working with a student who was trying out Frogs using three blue frogs and three red frogs. Do you think they have a winning strategy? Can you explain why? Which key questions could you ask? Where would you take the activity next with this student? Here's another student trying out the interactive version of Frogs. 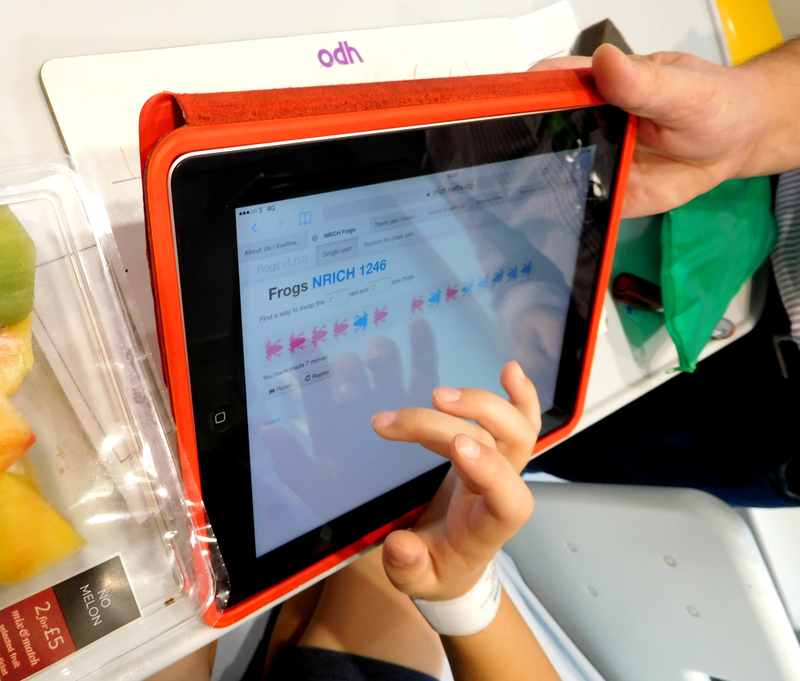 What difference does using the interactive make for the students? How did its facility for keeping count of their moves affect their resilience? How has working systematically enabled this student to generalise? Looking at the number of steps taken for each set of frogs, how did they arrive at their equation? Hint: remember to look at the difference between the numbers. Don't forget to look back at the Teacher Notes with the Frogs activity - there's planning advice but also student solutions you can use or adapt for your own students. After everyone had shared their feedback, we moved on to the main focus of the session: exploring the four stages of problem-solving. Encouraging students to tackle an activity is often the biggest challenge. We looked at an activity, One Big Triangle, which could be tackled in numerous ways. We discussed some of the ways adopted around the room - trial and improvement, making it simpler by finding pairs first of all, working top down so there were fewer options and so on. Whichever way we tried seemed to work, we did reach a solution. A follow up activity with students could involve exploring which were the most effiicient approaches as well as reflecting on the student solutions on NRICH too. Remember to encourage students to consider more than one solution. Have they found all possible solutions? How do they know? Once we'd explored ways to get started, we moved on to another activity called Two-digit Targets. This offered plenty of opportunities to explore an activity in different ways. To begin with, the most popular approach was finding a number which satisfied the criteria as we worked our way down the list. As we began to reflect on the challenge, we realised that we could get nearer, much nearer, to some of the target numbers by reviewing our initial answers. We became even more focused when groups decided to award penalty points for how far their answers were away from the actual target. Again, it is worth exploring the Teacher Notes for ways to adapt this activity as well as key questions for the students. This was the stage where we looked at the 6 Beads activity. Although finding an answer is straightforward, ensuring that students have found all possibilities is a little more challenging. One popular way of knowing that we had found all the possible answers was using proof by exhaustion. By tring out different numbers of beads we were also able to test out our pattern spotting skills and begin to generalise about our findings. How could this activity be adapted for younger or older students? This stage is so important for the students because it allows them to reflect on their learning and communicate their findings too. We tried out the activity How Would We Count? and soon found out there were many ways to calculate the total, some probably a little more efficient than others! Don't forget the RSPB organise a national bird watch for schools every January which offers an ideal context for students to apply their counting skills and contribute towards a live research project too. Explore at least one of today's resources with students. Take careful note about the ways in which you work through the four problem-solving stages. When did the students seem to struggle the most? How did you support them? If you chose Two-digit Targets, don't forget that it's a Live Problem this term so their solutions can be submitted to NRICH. Please remember to share your photos and examples of work with Kate before the next meeting so that she can send them to Ems who will upload them to this page.